For Ron Hynes, it's all about the songs-and the soul-baring stories… and he has a few left to tell. Salt-drenched air blows through the open doors of a pub on the Halifax waterfront during the sleepy afternoon hours before the weekend begins. The dinner crowd hasn't yet arrived. The patrons who knocked off work early are scattered in booths, nursing draft beer and watching golf on TV. On the music stage, a sound man is working slowly, raising microphone stands and running cables to a mixer. Outside in a small courtyard behind the pub, a thin man in a black cowboy hat, jean jacket and scuffed suede western boots paces and smokes a cigarette. 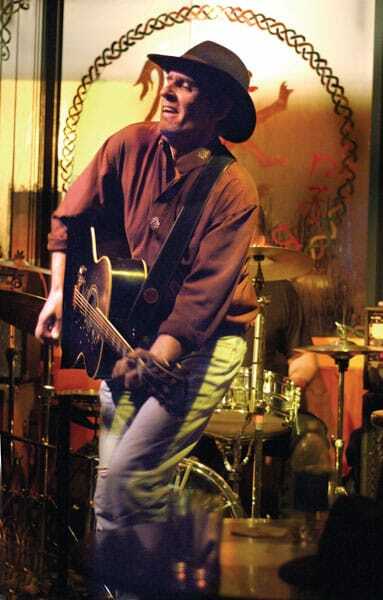 When the sound man calls out that the stage is ready, Ron Hynes takes the first steps in a ritual dance he's performed countless times in bars and concert halls across Canada. He carries a guitar case patched with duct tape to the stage and lifts out a black Gibson jumbo, its finish rubbed through to the wood. He plugs in and steps up to the microphone. 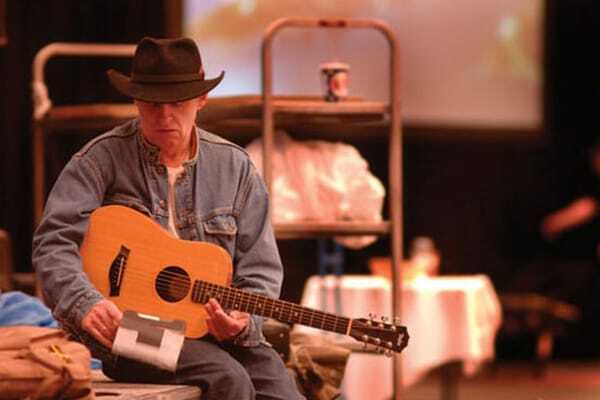 He strums a few chords to let the sound man set the levels, then begins singing about a young man who left home when the summer came and headed north to find work in the gold mines. The song fills the air of the pub and for a moment the room falls under its spell. Then with a nod from the sound man, it's over. Another sound check done. Ron sets his guitar in the corner of the stage and sits down for a meal and the long wait before the real show, once the Friday night crowd arrives. He'll play his show, then leave on an early-morning flight back home to St. John's, Newfoundland, the place that has defined him as an artist for more than three decades. He is "the man of a thousand songs,"-a title gleaned from his own lyrics-and, according to Larry LeBlanc, the Canadian bureau chief for Billboard magazine, he is the best singer-songwriter in Canada today. "He touches people," says Larry, in Halifax this past fall to hear Ron play. It's easy to write complicated songs, he adds; it's a rare gift for songwriters to be able to distill a song until only its essence remains. "He's a treasure." Ron is now singing, playing and writing as well as he ever has in his career. His CD Get Back Change, released in the spring of 2003, won the East Coast Music Award's Album of the Year in 2004. Last year he was back in the studio with Canadian roots music producer Paul Mills to record the follow-up CD, slated for release early this year. There are 14 original songs on the new CD, 10 of which were recorded in the studio and four live at the LSPU Hall in St. John's last April. Ron wrote most of the songs after Get Back Change, although several date back to his early years as a songwriter in the '70s. With little production embellishment, the new collection is said to be his most personal, soul-baring work to date. Ron has played shows from coast to coast and has gone south to Nashville, Tennessee, to play a part in the songwriting industry, but he always returns home. In fact, it was a song about the struggle to stay home in Atlantic Canada while being pulled away by our dreams that made him famous. He wrote the song in 1976 in the back of a van when he was on the road with his band in Western Canada. It's a simple song about two men: Ron himself, and his uncle Thomas "Sonny" O'Neill. Sonny taught Ron to play guitar, to listen to Johnny Cash and Hank Williams and the Carter Family, and to dream of playing music professionally. Ron called the song "Sonny's Dream." After writing it he shelved it for a year-he has 100 or so songs on the shelf today-and premiered it at a concert at LSPU Hall in 1977. Soon after, he played it out of desperation during an encore with his group the Wonderful Grand Band at a lounge show in the Village Mall, in St. John's, when the band had run out of songs. The next night the bar patrons were calling for "Sonny" and Ron realized he might have written a hit. Since then the song has become a folk classic, covered by dozens of artists-most famously by Nashville legend Emmylou Harris-and claimed as a native tune by both Scottish and Irish folk singers. Its chorus has become so well known internationally that many people think it is a traditional song, and perhaps now it is. Ron calls "Sonny's Dream" a gift, plays it at all of his shows (he introduces it with an expression of gratitude for all those who love it-"my mother thanks you, my children thank you") and says with a grin, "it's nice to be known for something." "Sonny's Dream" was a long time ago, the work of a young artist who has been much more than a one-hit wonder. But if "Sonny" was a gift, it was one that Ron earned by paying his dues in an unforgiving business. One of the songs from Get Back Change, "My Old Man," is an autobiographical piece about Ron's connection to his father, who went away to fight in the Second World War as one of the famous "First 200" Newfoundlanders who enlisted. He then spent his life after the war working at sea, never really coming home until his oldest son, Ron, was grown and gone. Today his father suffers from advanced Alzheimer's disease in a nursing home in St. John's, and remembers little about his life except the day he walked from Ferryland to enlist for the war-a short period of his life he can recall in great detail. Ron writes about how he has in some ways followed in his father's footsteps. The spotlight of the music industry is slippery indeed, with musicians and producers trying to predict the ever-changing tastes of critics and record buyers. Ron says true songwriting should transcend the demands of industry trends and the search for hit singles. A songwriter's purpose is to document who we are as a people. Where do we come from? Who do we love? Why do we love? He sees himself as part of a long tradition of songwriting in Newfoundland, one in which people write songs and teach them to their family and friends as a way of documenting events that should be remembered. Ron's best songs are part of the story of Atlantic Canada itself. "I've loved being a songwriter [but] I've never loved the music industry," he says. "At best it's been an uneasy relationship for all these many years. You have to get out of bed and do the work and you can't do it for the money. You do your job as a songwriter and eventually the music industry will come to you." Ron Hynes grew up in Ferryland, a fishing community south of St. John's where his mother still lives in the old family homestead in the centre of town, 50 feet from a beach on the Atlantic Ocean. He was born December 7, 1950, the first of four boys. By the time Ron was a teenager he had decided he would pursue a life as a performer. He worked the coffee house circuit in the 1970s and joined a group of musicians and actors called the Mummers Troupe that toured across Canada. He was a founding member of the Wonderful Grand Band, a musical comedy act that included comedians from the popular group Codco. The success of "Sonny's Dream" led him to Nashville and a trip through the heartland of industrial songwriting. He had an Emmylou Harris cover on his resume and music publishers saw him as a source of more hits. Soon Ron was working with other songwriters in scheduled sessions. He recalls his first appointment when he was told that his collaborator had an hour and 40 minutes, and he was to "bring the idea." So he arrived with a song idea called "One of the lonely," and a hook: "One of the lonely doesn't want to be lonely tonight." The song was covered by a Nashville recording artist two weeks later. Ron could play the game, but he felt he had more of a contribution to make than novelty songwriting. One of the tracks on the new CD is "Just Like a Movie Scene," written in 1974, at a time when Ron came into his own as a songwriter and artist. "The secret for me was to get outside myself," he says. "I started going through a period [then] of getting outside myself." He was no longer simply writing about his own life. His songs from that time forward would address the shared experience of a people. Songwriting for him begins with the lyrics, from which he can hear the melodies emerging. "He was always the guy who wrote the best lyrics and melodies," says Newfoundland songwriter and musician Chris LeDrew, who has known Ron and followed his work for many years. Chris recalls how Ron has been an inspiration to aspiring Newfoundland musicians. Ron was the first to step out at city nightclubs and perform his own material, and he encouraged other singer-songwriters to do the same. "He was always there if you wanted to play something for him," Chris says. About 10:30 p.m. at the Halifax waterfront pub, Ron straps on his Gibson and takes over the room as only a veteran performer at the top of his game can. With energy and good humour, he ranges back and forth from old familiar songs like "Man of A Thousand Songs" to relatively new songs from Get Back Change, such as "No Change In Me," the powerful closer on the album, co-written with Canadian songwriter Murray McLauchlan. He puts down his guitar and performs two of his songs a cappella. They are old-style barroom songs; the clapping, foot-stomping pub crowd keeps time with the lyrics: "We're dirt poor but we're not dirt bags." The a cappella numbers "Dirt Poor" and "Three Cheers for the Buccaneers" are two of the tracks on the new CD that were recorded live at the LSPU Hall in St. John's. Throughout the show he keeps returning to the songs that chronicle the people around him, like the "St. John's Waltz," inspired by watching visiting Portuguese sailors play soccer and flirt with the local girls. Ron takes a break, stepping outside to smoke and chat with the patio crowd. When he returns he sings the song that he considers his most important work, a song called "Atlantic Blue." It tells the story of a woman's anguish after the loss of her husband on the Ocean Ranger, the world's largest offshore drilling rig that was hit by a fierce storm on Valentine's Day, 1982. All 84 crew members died when the rig capsized and sank. Most of them were Newfoundlanders. In the days that followed the tragedy, Ron's friends asked him if he would write something to memorialize the event. For a long time, Ron felt the Ocean Ranger disaster too difficult a story to address. But six years after the rig sank he sat for a day looking out at the narrows in the St. John's Harbour and wrote "Atlantic Blue." It took him a year to learn to sing it well and it became the closing track on Cryer's Paradise, released in 1993. Since the song's release Ron has met grandchildren of the men who died on the Ocean Ranger, and they consider "Atlantic Blue" their song. And so it is. "If I'm not writing these songs I'm not doing my job," Ron says. He plays the title track "Get Back Change" as an encore and then puts down his guitar to sing one more song a cappella-an old folk song of the sea called "Barque in the Harbour," written by Gerald Campbell, a legendary songwriter from a tiny community called Branch on Newfoundland's Cape Shore. All of this flows together effortlessly. He raises his glass, and begins signing CDs and mingling with the crowd. Another road trip is completed. Now he can go home. "I've never been able to escape New-foundland," he says. "The decision to stay there has coloured my work forever more." Ron will keep going so long as his favourite song is the one he's about to write, so long as he feels there is another great one just around the corner. Every day that he is home he reads the words of playwright Samuel Beckett that he has tacked on his wall: Perhaps my best years are behind me. But I wouldn't quit. Not with the fire in me now. Some day, he says, he plans to stop touring and move back into the old homestead in Ferryland where he will continue to write songs about the people he knows and loves best, songs that will long remain with us as part of the fabric of our lives.